Who needs a 5% pullback for the next leg of the 2017 stock rally? 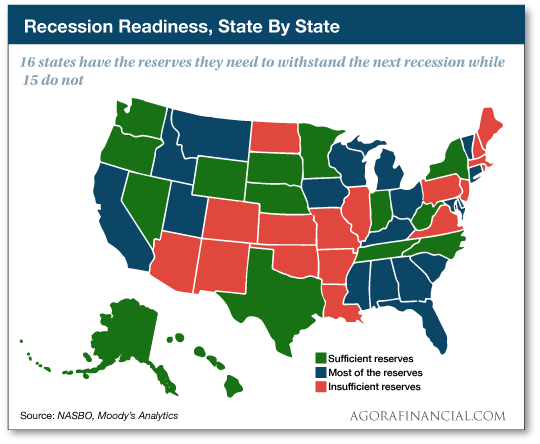 Is your state ready for the next recession? No, you won’t need a passport for a domestic flight (probably)… a silly California law is repealed (partially)… a chance to turn back the clock on penny pot stocks… and more! We had no idea the Chinese Communist Party was so hostile to golf. Last Friday, the government of Fusong County in the northern province of Jilin ordered two golf courses to shut down. And not just any golf courses. These are luxe properties designed by Jack Nicklaus and architect Robert Jones… and owned by the Dalian Wanda Group. The company’s founder, Wang Jianlin, is the richest man in China, worth $31.4 billion. And while the ban was lifted after Mao was gone, the party was never completely at ease with golf. Two years ago, President Xi Jinping barred Communist Party officials from playing golf; he felt the golf course was a den of corruption. We daresay the golf courses might have been shut down to “send a message” only days before the every-five-years Communist Party Congress — which opened in Beijing today. 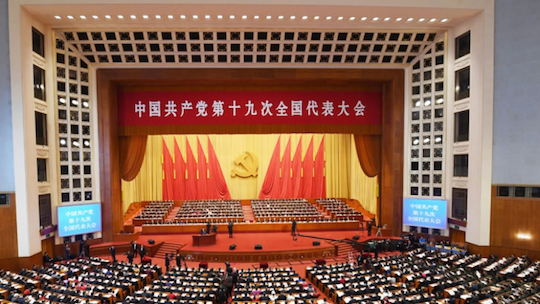 China watchers say President Xi will use this event to consolidate his power and become the strongest Chinese leader since Mao himself. To demonstrate that he’s large and in charge, his opening address droned on for 3½ hours, “testing his comrades’ eyelids — and their bladders,” says an account in The Guardian. Did anyone dare get up for a potty break? The speech was chockablock with platitudes. 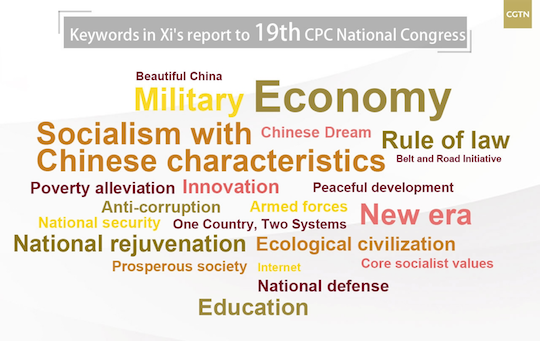 “The Chinese dream is a dream about history, the present and the future.” Stirring stuff, huh? 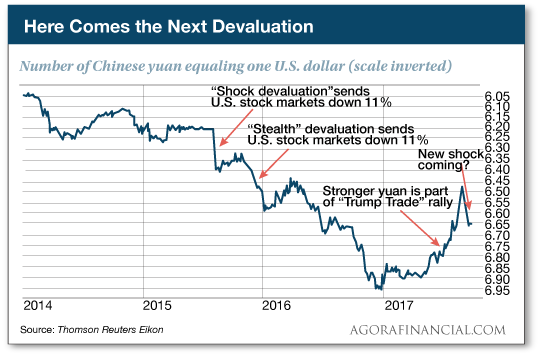 While the words “currency devaluation” don’t show up in that word cloud, a new devaluation of the yuan nonetheless starts today — which, if recent history is any guide, will be bad news for the U.S. stock market. “In August 2015,” Jim Rickards reminds us, “China engineered a sudden shock devaluation of the yuan. USD/CNY gained 3% in two days as China devalued. The results were disastrous. U.S. stocks fell 11% in a few weeks and there was a real threat of global financial contagion and a full-blown liquidity crisis.” The shock was enough to force the Federal Reserve to postpone an interest rate increase by four months. Then came another devaluation toward year-end. “This time China did not execute a sneak attack,” says Jim, “but did the devaluation in baby steps. This was stealth devaluation. This year, Xi and other Chinese leaders have been busy buying time until the next devaluation — putting off any turmoil until after the Party Congress concludes. An exchange rate pegged to the U.S. dollar. In 2015, the Chinese cracked on that third one — the yuan’s peg to the dollar. “The problem for China is that these solutions are all nonsustainable,” Jim says. “China cannot keep the capital account closed without damaging badly needed capital inflows. Who will invest in China if you can’t get your money out? “China also cannot maintain high interest rates because the interest costs will bankrupt insolvent state-owned enterprises and lead to an increase in unemployment, which is socially destabilizing. Already in the six weeks leading up to the Communist Party Congress, the yuan has devalued from 6.45 to the dollar in early September… to 6.63 to the dollar this morning. Oh, and it would be a potent weapon as China and the United States gear up for a trade war and a renewed currency war. Jim expects a yuan devaluation to 7.95 or even lower; we’d have to double the size of that chart above to reflect a drop that huge. Just imagine what that would do to the U.S. stock market. But that’s all in the future: Today the Dow has decisively cracked the 23,000 level — 23,103 at last check. “After an excruciating wait of more than two months, we finally have another 1,000-point climb to celebrate!” snarks Greg Guenthner in today’s Rude Awakening. “Of course, these little 1,000-point parties are completely ridiculous. If you stay glued to the financial news, you might even feel the market mania starting to set in. Word’s getting out: The stock market is hot. “Way back in the summer, we noted that a 5% pullback would scare plenty of weak hands out of stocks and provide the perfect setup for a blazing fourth-quarter rally. Our reasoning was simple: Most investors have forgotten what a pullback even feels like. Even a mild correction could induce some serious short-term panic. Gold’s slide back from $1,300 continues, the bid now $1,280. Bitcoin is down 8%, to $5,175 — which is still higher than it was at any time before last Thursday. Depending on whom you listen to, the catalyst might be cryptocurrency remarks from U.S. regulators. The Commodity Futures Trading Commission just published a paper saying the virtual “tokens” that are key to initial coin offerings can come under the CFTC’s oversight. There’s no doubt the government is looking to exert some control over the Wild West of cryptos… enough to make our own lawyers sit up and take notice. As a result, Agora Financial has ceased giving away free ethereum with a subscription to one of our premium trading services. Just the possibility of ethereum being labeled a “security” like a stock or bond is enough to make us shy away. We can recommend securities all day long, but we can’t buy or sell them… or give them away. In any event, we’re confident any price dip in crypto thanks to regulation chatter will be a short-term affair. It certainly was in the case of the Chinese crypto crackdown last month. For the record: Only 16 states are in good enough fiscal shape to make it through the next recession without a crisis. That’s according to a report from Moody’s Analytics — which conducted stress tests on every state’s budget. And undoubtedly there would be stress. Tax revenue would fall and demand for services like Medicaid would rise. Years ago, our executive publisher Addison Wiggin issued a report saying when the “mother of all financial bubbles” bursts, you’ll feel the effects on the local level first. Services you’ve come to take for granted won’t be around anymore. That’s as true now as it was then… and sooner or later there will be a new recession. Contrary to the news you might have seen today, the likelihood you’ll need a passport to take a domestic flight come January is nil. It’s true that under the Real ID Act of 2005, states are required to make their driver’s license photos compliant with facial-recognition software and to make their driver’s license databases available to the feds. It is also true that several states have been dragging their feet… and they face a deadline of Jan. 22, 2018. In theory, you’d need a passport to get on any flight after that deadline — even a domestic flight — if your state isn’t in compliance. But in practice, this deadline has kept sliding for more than nine years. Yup. As we said then, the feds know exactly how far they can push things before the governed withdraw their consent. Now an update on a bureaucrats-gone-wild story from the Golden State. A quick refresher: California lawmakers unanimously passed a law last year requiring bookstores to authenticate autographed books and memorabilia — and how! The litany of rules was so onerous, many bookstores stopped doing the one thing book-selling giant Amazon can’t do — author book signings. If booksellers failed to follow the letter of the law, they faced expensive lawsuits. In response, The 5 reported, booksellers were filing suit against the state (and we high-fived their efforts). The rollback of regulations, signed by Gov. Brown, also excludes memorabilia under $50 from the arduous certification process. Hooray? By the way, California booksellers can thank Mark Hamill — aka Luke Skywalker — for pressuring the state to crack down on fraudulent autographed merchandise. Hmm. This time, the force wasn’t with him. P.S. Worried that you missed out on the revolution in penny pot stocks? Worry not… because our resident expert Ray Blanco has just spied a $22.6 billion opportunity he says is like turning back the clock. Don’t miss out this time — it might be your last chance. Used to be the flip phone was an embarrassing relic. Today? Smartphone heavy hitters are in a race to “foldable” phone technology. One of the more famous — and prescient — predictions anyone ever made on CNBC was when a hedge fund manager named Whitney Tilson labeled Netflix a buy in 2012. “Corporate America has announced more than $1 trillion of buybacks for 2019,” says Mike Burnick. Our income expert Zach Scheidt — from his years as a hedge fund manager — has come to expect dubious deals from Wall Street. Here’s how to spot IPO shenanigans… and how to profit. The wealthier you are, the more likely you are to think the new tax law screwed you.